Having snapped up this pretty little barrel-shaped Charolais in Hamish Johnston last weekend, in a bit of a rush to get back to the house and light up the barbeque before the heavens opened, I assumed that I could Google the important details at a later date, tack on a tasting note or two, and call it a review. After all, that's how this process normally works. 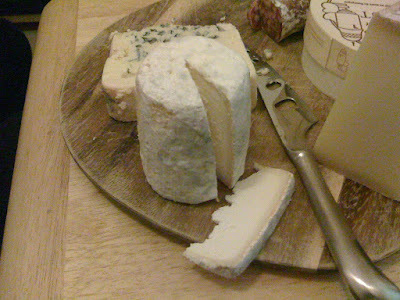 I don't, believe it or not, have an encyclopaedic knowledge of cheese - in fact I'd be lost without sites such as Fromages or http://www.slashfood.com, where the intimate particulars of almost every cheese you can think of is listed in extraordinary detail. Very handy they are indeed, to a chancer like me. But while pulling together a set of notes for Charolais, I came across a number of annoying inconsistencies. Charolais is "traditionally" made, according to Fromages, from a mixture of one part cow's to two parts goat's milk, and although production varies from farm to farm - this is after all an artisan product, not a Kraft cheese slice - from the handful of sites I've browsed it seems this element of mixing and tweaking the mix of cow's to goat's milk is an important part of the character of the cheese. And yet what's this - on 23rd January 2010, according to Slashfood, Charolais became a AOC label cheese, and as part of the strict criteria that comes with this poisoned chalice, using cow's milk in any stage of the process is now strictly forbidden. I'm a bit grey on these AOC and DOP badges. Protecting culinary heritage and artisan producers is all very well, but it seems odd that a group of bureaucrats can in the year 2010 suddenly put a stop to a perfectly valid method of producing perfectly good cheese that's been going on since God knows when. Or if not put a stop to it then prevent people calling it Charolais. I'm sure they think they're preserving authenticity but in the end it's them that's decided what's authentic in the first place. The reason I mention all this is because this authentic, authenticated and genuine Charolais, presumably made from 100% goat's milk because them's the laws nowadays, didn't really excite me very much. 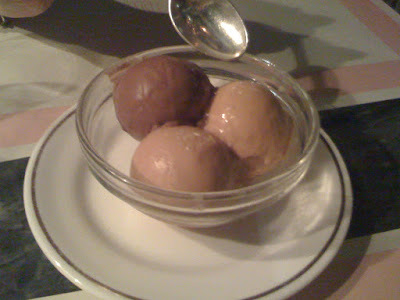 The texture, first of all, was very uniform and cloying - moisture is usually a good thing but this was rather unpleasant; it coated your mouth like putty. And there wasn't much going on in the flavour department either. At first there was almost literally no flavour at all, but then a hint of a grassy aftertaste prevented the whole thing from being a complete waste of time. Still, it's hardly a ringing endorsement of the strict new designation - if is an example of an AOC Charolais then I can't really see why it was worth protecting in the first place. So the question is, would this cheese have been any better if the producers had been allowed to use a mix of cow's and goat's milk to their liking, or tweaked various other elements, even if they wouldn't have in the end been able to call it Charolais? My instinct says yes. The habit - and I'm mainly talking about France and Italy here, though there are other examples - of obsessing over and dictating the ingredients, process and geographic location of a cheese at the expense of ending up with a product that is actually any good to eat, seems incredibly counter-productive. If someone started making an Epoisses-style cheese in Canada (don't laugh) and it tasted just as good, I'm sure there would be very few people who would care that it wasn't "authentic". Then again, the Canadians wouldn't know what to do with a cheese that you couldn't melt onto chips, so it's probably nothing we'll ever have to worry about. Bob Bob Ricard is a strange, glittering fantasy world at the best of times, as opulent as Versaille and as superficial as Oz, its chandeliers and emerald green lamps leaving just enough in the light to be beautiful, and just enough in the dark to be inscrutable. It's not so much like stepping back in time as stepping into another universe, or taking a trip on the Hogwarts Express to Wonderland, where bizarre details ("Press for Champagne") lurk at every turn, and charming staff in powder pink uniforms prepare psychedelic cocktails and serve beef soup from a teapot. Returning for the first time after the infamous Vintage Vodka Tasting evening, however, was an even more peculiar experience than normal. Occasional details and tastes would trigger a memory of groggy vodka-laced incident from last month, provoking a hot flush of shame or a sharp uncontrollable guffaw, or very often both at the same time. I'm sure my dining companion thought I was going mad. Perhaps I was. But I said I'd be back, and here I was, settled into a cosy green booth and sipping on an extraordinarily good rhubarb gin and tonic, sweet and frothed with egg white. A vodka Appletini was equally good, served ice cold and in lovely glassware. 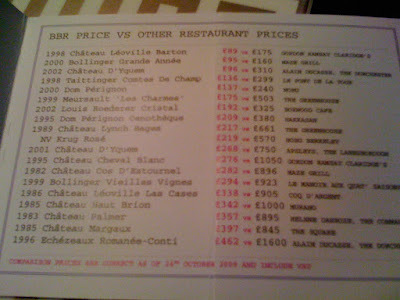 Based on this evidence it would be well worth just popping into Bob Bob Ricard's downstairs bar for a cocktail, but then I'm not entirely sure it's possible to just "pop in" to Bob Bob Ricard at all. You never really feel in control of your own actions in this place - you're stealthily manipulated into having a good time, whether you like it or not. I had specifically returned for the Zakuski - bite size Russian dishes served with ice-cold premium vodka. 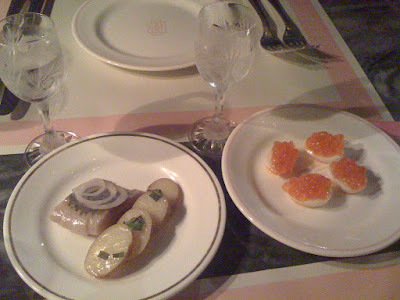 The pickled herring and boiled potato was as good as I barely remember, and salmon roe on quails egg was a delicious combination of soft egg and salty, bursty roe. Kauffman vintage vodka washed them down far, far too easily, and was again served in very attractive glassware, the immediate sight of which whisked me back a month and to a vision of me trying to decide which of two forkfuls of ox tongue in aspic I was holding up was real and which wasn't. I hope I guessed correctly. 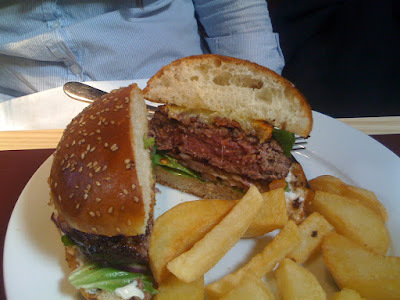 The Bob Bob Ricard burger turned out to be one of the best I've tried in London. I won't go so far as to say this was a surprise - nothing in BBR is a surprise, your expectations are assaulted and confounded so frequently the abnormal becomes normal - but it was certainly welcome. Good quality beef, cooked perfectly medium, and a good strong sesame bun. Word has it that BBR are soon to launch an authentic American burger, using Kraft cheese. Another reason to go back, damn them. 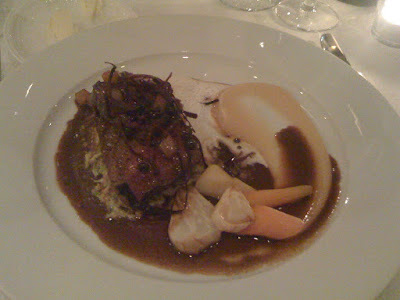 A second main course - a special - of roast veal, foie gras and black truffle jus was simply wonderful. 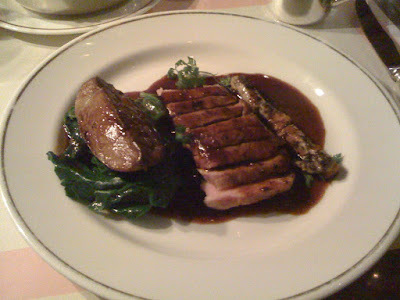 Light, pink veal, sliced into delicate pieces, sat on top of a bed of juicy spinach and beside a generous slab of wobbly, buttery foie. And the black truffle jus was so good (and came in such quantity) I ordered extra bread to soak it all up, only just resisting the temptation to drink it straight out of its silver serving jug. One of the best dishes I've eaten all year, and proof that Bob Bob Ricard seem to be able to master French cuisine as well as they do everything else. I hardly ever order desserts, but I couldn't leave without trying some of their homemade ice creams, including a delicious salty caramel. I was probably too full to make the most of them, but sadly I didn't have a choice in the matter. The restaurant chose for me. At the end of the evening, I'd spent too much, drunk too much and eaten far too much, but I can't say I feel too guilty - it was all essentially out of my hands. Bob Bob Ricard is a huge, manipulative, mind-altering experiment in decadence, and if you can relax and surrender yourself to their whims and fancies you are guaranteed a good time. Far too much of a good time, in fact - far too much than is good for you. You may think I'm exaggerating, that I'm a glutton and a hedonist and weak-willed. Perhaps you're right. 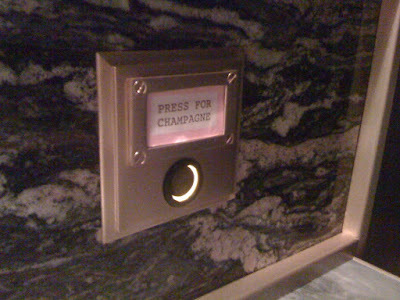 But if you sat down at a table, plush and inviting and romantically lit, and saw a button shining beside you marked "Press for champagne", can you put your hand on your heart and tell me you wouldn't press it? Honestly? 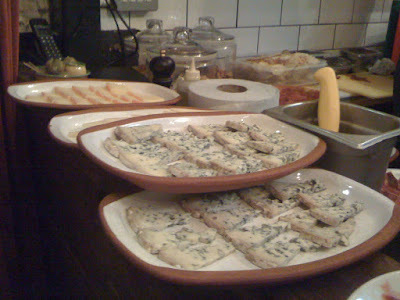 Spanish cuisine is one of the things that London seems to have been doing very well of late; I've never had anything less than a great meal in all of the Brindisa outposts, and places like Dehesa and Salt Yard are consistently excellent, so I was understandably frothing with anticipation at the prospect of visiting London's first, dedicated sherry bar. The idea appealed hugely, and seemed eminently sensible. Think of how many "fusion" restaurants are actually any good - when was the last time you went anywhere that did an excellent fish and chips AND an excellent Thai green curry? It just doesn't happen. The key to a good restaurant or bar is not to try and be all things to all people, but to focus on what you're good at, and do just that one thing VERY well. You won't find Tayyabs putting chicken korma on the menu because some people don't like spicy food - those people just won't go to Tayyabs. And quite right too. 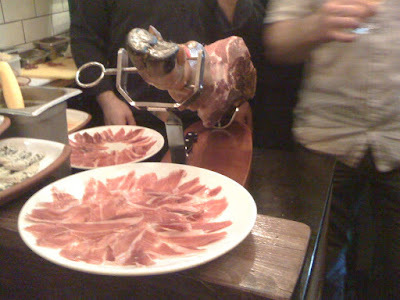 I would have happily blown my own hard-earned cash on an evening supping chilled Tio Pepe and folding in slivers of freshly-carved Jamón ibérico, and in fact very often have, but I was lucky enough to be invited to Bar Pepito on the press night, and didn't pay for any of it. This report, then, comes with the usual caveats that apply to many of these press launches - they give you far more free booze than is good for you, the service is eager to impress, and the PR people are charming and informative. But I have a very strong suspicion that even without any of this, I still would have fallen in love with the place. First of all, it's a lovely little spot, tucked away in an old warehouse around the back of Kings Cross, with attractive bare brick walls and and a very authentic Iberian feel. Secondly, the quality of the tapas is absolutely top notch. 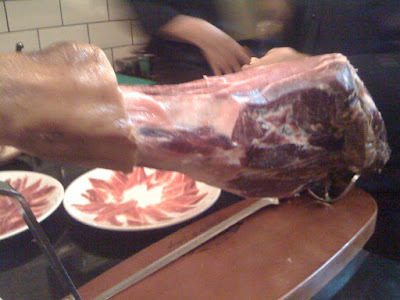 Not only do they have a wonderful selection of Spanish cheeses (albeit sweating slightly in the heat of the room - an airconditioning unit will be required to get them through the summer months I think), but they also have a qualified "Master Carver", who last night was expertly carving a leg of genuine pata negra into a plateful of delicate wafer-thin morsels. And last but not least, the sherries. Despite the owners being Gonzalez Byass they have a commendably liberal selection from other producers, neatly categorized into 'Manzanilla', 'Amontillado', 'Fino' and so on. The Tio Pepe Fino (£3.50 a glass) was as good as ever, but I also managed to try a glass of a sweeter 'Matusalem' (£5.50) which went very well with the cheeses. I'm a complete sherry novice, and I'll leave it to others far more knowledgeable and qualified than me to go into more detail on the drinks, but I thought they were both superb. Sounds like the perfect bar, so far, doesn't it? And that's kind of the problem. It is. And in a part of town crying out for just this kind of post-work casual-but-different drop-in spot. And it's attractive, and reasonably priced (a plate of that lovingly-carved, top-quality Iberico is £15, a steal compared to some places), and friendly. But it's absolutely tiny. 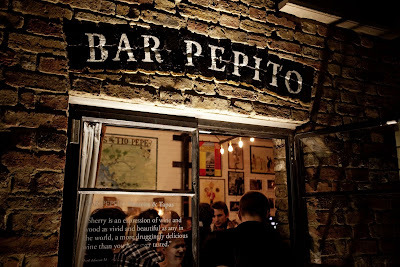 With barely a half dozen customers Bar Pepito would feel buzzy - in full flow on a Friday night I'd be very worried you wouldn't fit inside at all. But then again, the courtyard outside has tables and chairs, and soon summer will be here and happy customers will spill outside with chilled Fino and plates of ham and all will be well with the world. 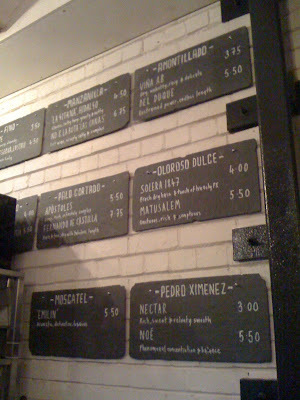 Until then, I strongly urge you to visit Bar Pepito before the secret's out and it's packed to the rafters every night. Because it will be. You mark my words. 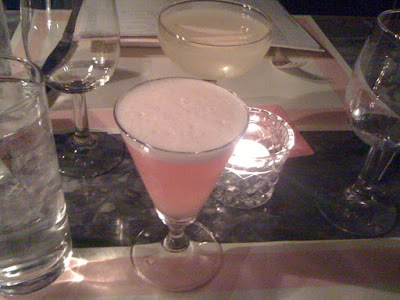 I was invited to review Bar Pepito. Initially they will open Wednesday to Saturday from 5pm until midnight. London should be the greatest city in the world if you love sandwiches, shouldn't it? Just look at every high street in the city. 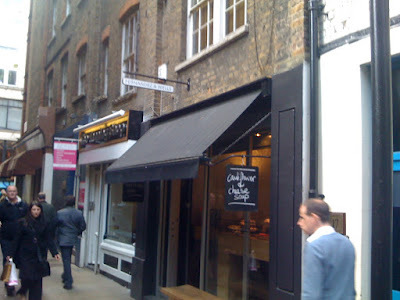 There are more sandwich shops than almost any kind of business, from Pret a Manger to Eat, Benugo to Pod, Abokado, Apostrophe, the list goes on and on and oh God it goes on. 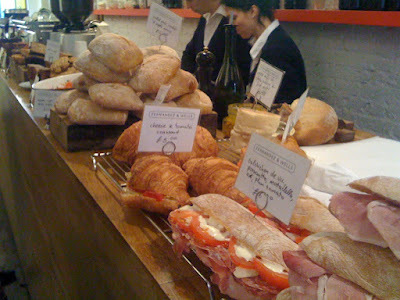 London must be a great place if you like sandwiches - just look at the queues! Look at the variety! Except, of course, it isn't. Apostrophe tantalises at first with its French patisserie style until you realise the beauty is skin deep; ordering from Benugo is like trying to buy a car in Communist Russia ("No, sandwiches are over there. I'm just soup. No, you can't pay here. Take your receipt to the till. No, drinks are from the cabinet. "); and the only way Pret could get any more mayonnaise into their produce is if they somehow developed a bread made entirely from egg yolks and olive oil. So thank the lord for Fernandez and Wells, a (very mini) chain which stands so far above the head and shoulders of any other sandwich monger in the area it may as well be on stilts set into those shoes Elton John wore for Tommy. With things like English muffin with fried egg and black pudding, proper Swiss-style raclette and freshly-sliced Spanish ham on the menu, choosing your lunch at Fernandez and Wells is a thrill and a delight, in stark contrast to the miserable experience of selecting whichever item in Pret is the least likely to give you a mayonnaise-induced coronary. Fighting back the temptation to order everything all at once, I limited myself to a pulled pork and apple sauce sandwich, a handful of stuffed chillies, and a little Portuguese custard tart, and carried them all off to eat in the sun in Soho Square. The stuffed chillies were great, hardly cheap at £3.50 for five but with a very moreish mix of textures, cool feta cheese balancing the crispy heat of the chillies. 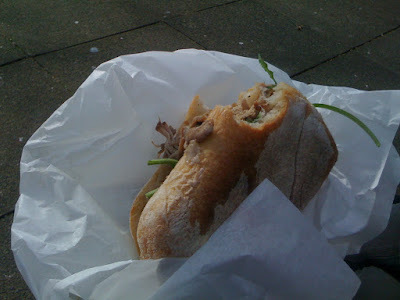 That my pork sandwich wasn't quite as good as that available from the Roast of Sherwood on Whitecross Street is hardly much of a criticism - only the addition of some crackling would have improved it. And best of all was that fantastic custard tart, every bit as good as the examples I tried at the world custard tart headquarters, Pastéis de Belém in Lisbon. Such quality, and expertise in the pastry department, comes at a price. The items above plus a bottle of Luscombe organic ginger ale came to £12, far too much to spend on lunch on a regular basis. But even just the pork sandwich and a glass of tap water would have made a sufficiently filling (and very tasty) snack for £5, and reason to traipse over to Soho from my office in Holborn. And there's every chance I may do just that again very soon. If you are a sandwich fan, and I mean a PROPER sandwich fan, then you should consider Jonathan Brown's Sandwichist column for the Londonist a must-read. The Word of Mouth article, with accompanying frothing, rabid comments is here. I'm yet to have a genuinely excellent sushi experience in London. I admittedly haven't been trying very hard, but after experiences like that at Sushi Say I hope you can understand why I'm not exactly rushing to receive an emotional battering anywhere else. But Ten Ten Tei, a tiny place on Brewer St just down the road from ubertrendy Hix Soho, has an excellent reputation amongst those in the know, and was perfectly situated for a budget lunch on Saturday afternoon. 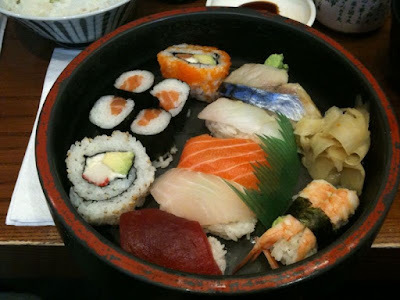 I was persuaded to give London sushi another try. Immediately on entering Ten Ten Tei someone screamed at me to "SHUT THE DOOR!!". Terrified and panicking, I whirled around and obediently slammed it shut - right in the face of a rather surprised member of the public attempting to enter the restaurant behind me. We stared at each other through the glass for a few moments, and then, having not been in this situation before and improvising madly, I made an executive decision to completely ignore what had just happened and re-open the door, standing aside with exaggerated good manners. The poor confused individual, a young Japanese girl, slowly sidled in, her eyes firmly fixed on me in case I attempted to put her face through the glass again. After she'd backed away to safety on the other end of the restaurant, I slowly, and carefully, shut the door once more. There was a very good reason, however, for Ten Ten Tei's door obsession. Our seats at the front of the bar were right next to the entrance, and every time a new customer arrived (and this being Soho, they arrived frequently and in great numbers) the icy winter winds blew painfully around the restaurant. The mechanism on the door was either broken or incorrectly set, and rather than closing automatically it remained wide open unless manually attended to. Throughout our lunch, the sound of the waitress screaming "SHUT THE DOOR!!" to each new group of terrified new customers was a regular event. Fortunately, the food made up for much of the physical and emotional torment. 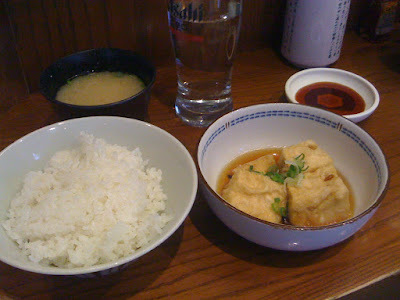 Unannounced extras of crispy fried agedashi tofu had a delightful texture and were served in a fiery hot broth. Miso soup was also particularly good, with a great rich flavour that you so often don't find in more mass-market offerings elsewhere in the capital (hang your head, Pret a Manger). And service, when they weren't busy yelling "SHUT THE DOOR!! ", was smart and efficient too, if not exactly friendly. 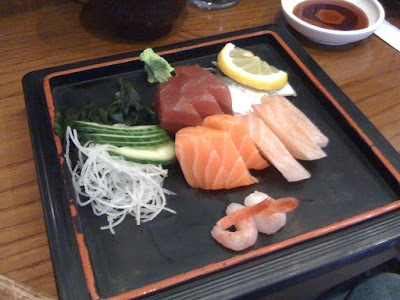 Even my sashimi was a cut above the average, with a couple of sweet raw prawns added to the standard mackerel/salmon/tuna selection. Perhaps I can be accused of playing it safe - I can hardly complain about ordering sashimi and then being given sashimi - but it wasn't a million miles away from examples I've eaten elsewhere. Even so, it was fresh and nicely presented and at £12 was very reasonably priced. Ten Ten Tei, then, is my new favourite sushi place. This isn't a huge compliment, given the competition so far, and it's still far short of various places I've tried in New York and Boston. 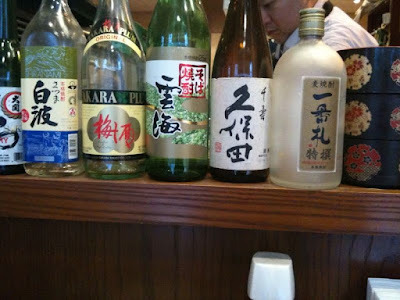 But it's handy, very reasonably priced, and comes with a bracing dose of authentic Japanese attitude. Comforted by hot miso and invigorated by fresh sashimi, I couldn't help but enjoy my lunch, and toddled back onto the Soho streets with a spring in my step. Remembering, it goes without saying, to shut the door behind me. First, the good news. 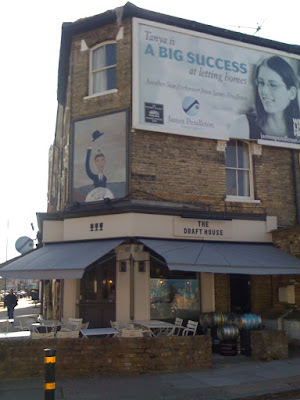 Both Draft Houses, that's the original, previously known as the Westbridge, on Battersea Bridge Road, and the latest on Northcote Road, have an absolutely stunning selection of beers, right up there with the best in London (and possibly only just behind the Rake in Borough Market). Not only are the drinks well selected, well kept and of impressive style and variety, they are also, from what I can gather, pretty reasonably priced. If you are a beer lover, you will absolutely adore the Draft House and never want to leave. If, however, food is your first love, then you may find less to admire. 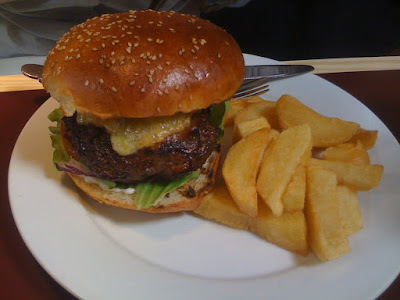 The burger was the most successful of the dishes we ordered yesterday lunchtime. An attractive dark glazed bun, studded with sesame seeds, held not too much salad, a light spread of mayonnaise and a thick, perfectly-cooked slab of beef with a well-judged texture (ie. not too coarse, not too smooth). The beef itself wasn't probably the best I've ever tasted, but it was helped out by a stroke of genius in the form of a thin crispy slice of pancetta, providing a crunchy, salty hit. This was a good mid-to-high-end burger. 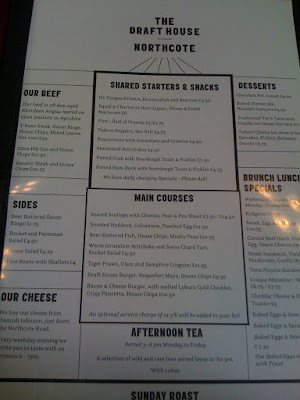 I have had, on other occasions, opportunity to try the Draft House's other shared starters and snacks, such as the delicious potted crab and ham hock and what is fast becoming their signature 'ox tongue fritters'. So I know that when the kitchen is on familiar ground and perhaps when they're more focussed they can produce some very tasty dishes. But I can't forgive that fish and chips I'm afraid - it didn't deserve to leave the pass and perhaps shouldn't have even been on the menu in the first place. That said, you'd have to be a very miserable character - more miserable than me, if that's even possible - to not be charmed by the Draft House. 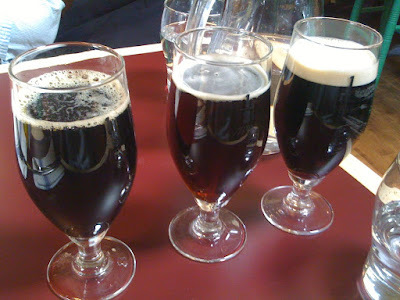 To drink I chose a flight of 1/3 pint each of three different dark beers and all were superb. Even the spirits selection is impressive, with more different types of Scotch and bourbon and rum and gin than you will ever need. Service sparkled too - friendly and efficient and incredibly knowledgeable on the huge selection of drinks on offer. It's a nice room, too, with its bright green details and dark wooden panelling. They also had an old NME cover on the wall featuring a young Elton John, so I'm going to give them extra points for that. 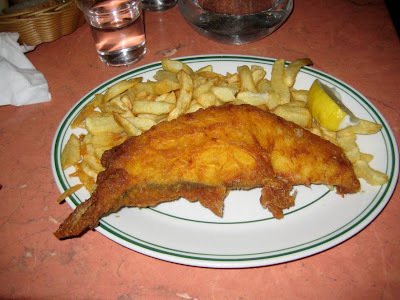 But what about that fish and chips? A careless mistake? A rare misfire? A missing chef? Or a gastropub putting an item on the menu because it feels it should and not because it's confident it can get it right? Time will tell, I suppose. In the meantime, enjoy the Draft House for what it currently is - a friendly and attractive space to drink a pint or two of some of the most interesting and delicious beers in London, and to nibble on some crispy ox tongue fritters and a pint of prawns while you do. 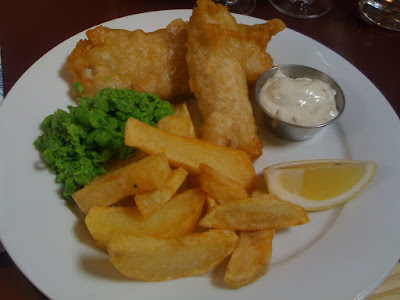 In fact, when you put it like that, who cares about fish and chips anyway? Reviewing a "popup" restaurant can seem at best pointless, at worst almost cruel. With such limited availability you're very unlikely to be able to use the review as a guide to eat out, and there's a danger the whole post could just seem like a protracted "look what you missed out on" taunt. 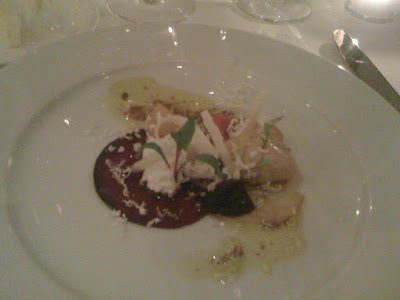 But A quick glance at the calendar over at the Putney Popup website reveals not only a few very tempting evenings still yet to sell out, including Atul Kochhar's Benares and Rowley Leigh's Le Café Anglais, but also a second date for Phil Howard of the Square, whose cooking I was lucky enough to enjoy last night. I hadn't visited The Square since early 2008 and yet the memory of that wonderful meal still seems as vivid. 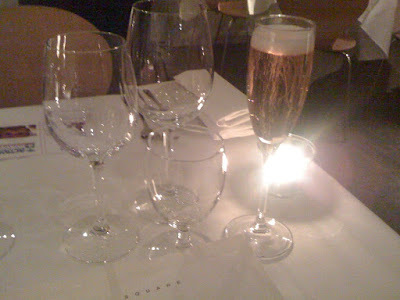 Put simply, I believe it to be the best fine-dining experience it's possible to have in London, even though these days it has strong competition from both its sister restaurant The Ledbury and the still scandalously unstarred Launceston Place in Kensington. 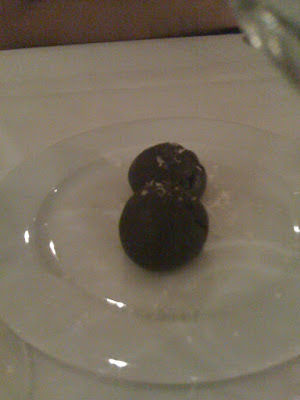 A charity popup restaurant isn't perhaps the fairest situation in which to assess Phil Howards team, who after all are trying their best in a different surroundings and with little to no 'bedding-in' time, but as I discovered last night, The Square at 80% is still a very satisfying experience indeed. Two dainty amuses were the first to arrive, one a tiny cone containing what tasted quite like taramasalata, and another which looked like a small black bread roll and contained some sort of seafood paste (possibly squid). Clever cooking techniques and robust flavours - even more impressive in a temporary kitchen. Beetroot and goats cheese is a tried and tested combination almost to the point of cliché - it seems every restaurant in the country has used these ingredients together at some point. But here, lightened with a clever balsamic 'cream' and using various different types (and colours) of beetroot it was lifted above the average. The vegetables were sweet and juicy, and shavings of parmesan added an umami kick. 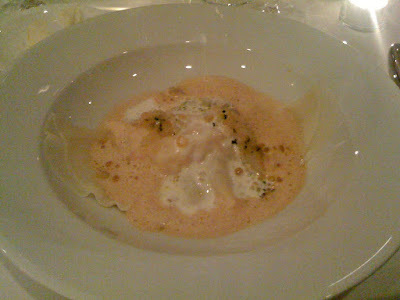 It's no real insult to say that the "ravioli of scallops and langoustine claws" wasn't quite up to the level of the truly mindblowing "Cornish crab lasagne with basil cappuccino" I was served at The Square a couple of years ago - after all, I think that crab is probably the single nicest dish I've ever eaten in my life. But their skill with top quality ingredients was still stunningly evident, from the sweet, clementine-flavoured champagne foam to the lovely course texture of the seafood mix inside the perfectly cooked pasta. I suppose it could be argued that this wasn't the most attractive of dishes, but what it lacked in visual appeal it made up for in heady, velvety freshness. Main course of smoked venison loin was even better. Sweet, impeccably cooked venison was arranged neatly on gorgeous creamed cabbage, and an interesting selection of root vegetables provided extra texture. It was all surrounded by a reduced sauce which was as good as any I've tried and provided a deep, silky bed for the venison and vegetables. This was most certainly a two Michelin star dish and all the more impressive for having been constructed in deepest Putney. A pre-dessert was reminiscent of the Ledbury's famous summer fruits Bellini, which immediately begged the question, where did they get their summer fruits from? 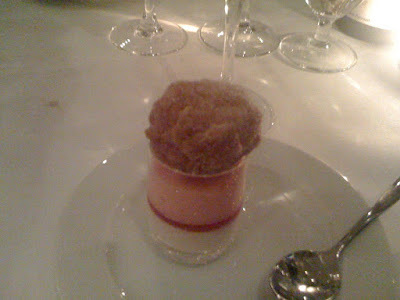 However all was forgiven on tasting it - perfectly balanced red fruit purée beneath a rich pink strawberry mousse, topped with a single light doughnut. 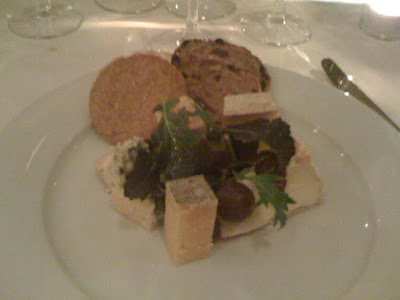 I had decided to go for the cheese course, and although I was perhaps slightly disappointed they hadn't brought over the complete cheese trolley from the mothership, they had nevertheless selected a very interesting plate of cheeses. 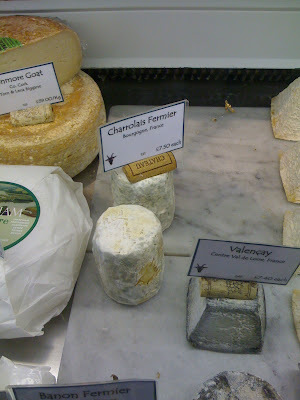 Comté, Stinking Bishop and Tomme de somethingorother were as tasty as always, but were overshadowed by a simply stunning piece of Camembert, definitely the best Camembert I've ever tried. All the cheeses came from Paxton and Whitfield, so I'm going to make it my mission to track down some more for myself. 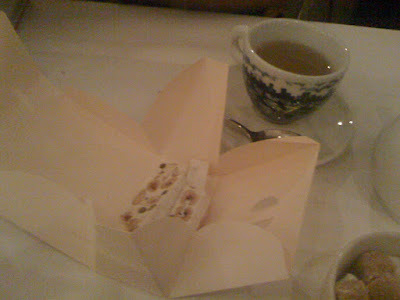 With petit fours of excellent nougat and a cup of fresh mint tea, we were done. The evening would have been worthwhile even if the food had not been delicious - the fact that it was also the best meal I had enjoyed in some time was a delightful bonus, and I'm pretty sure it wasn't just the smug sense of charity do-gooding that made it taste better. There's still time to snag a table for the next Howard evening on the 18th, so what are you waiting for? It's for a good cause, after all. 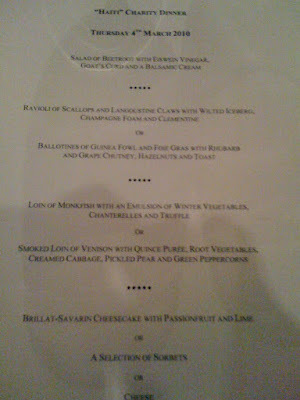 The meal at the Popup Restaurant in Putney cost £60 not including service and alcohol. Many thanks also to Rejina, my charming date for the evening. My slightly-tongue-in-cheek-but-actually-not-really In'N'Out campaign seems to have fans in unusual places. On an impromptu midweek visit with a friend to Goodman Steakhouse to try their house burger, restaurant manager Dave Strauss revealed he had a surprise for me. He and head chef John Cadieux had conspired to have a go at their own version of California's finest, and wondered if I would be interested in trying it. Seriously, a burger made just for me? How could I - how could anyone - say no? First of all, excuse (as ever) the poor photos but the brooding, testosterone-fuelled atmosphere of Goodman after dark does not make for a good studio. You'll largely have to take my word for the fact that the heaving "In'N'Out Double Double tribute burger" was absolutely, filthily marvellous. With two excellent beef patties supported by a couple of slices of melty cheese ("sourced" from the nearest corner shop apparently) and a token bit of salad, this was as authentic a West Coast burger I've ever eaten in this country. Admittedly, competition in this particular sector isn't sky-high, but everything about it seemed right - it was a good size and shape, fit well in the hands and bubbled with juicy goodness on every bite. I can't think how it could be improved upon, other than to eat it outside under the Californian sun. Even the bun, dark and glazed and not bearing much of a resemblance to the original, did its job perfectly and not only kept its shape well but provided extra sweet notes. 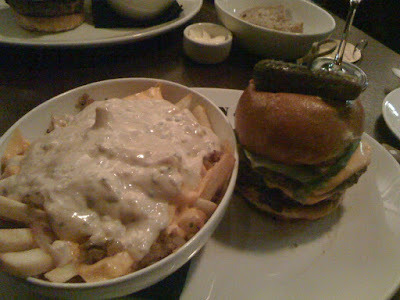 Along with the burger came a portion of "animal fries", chips soaked in yet more Kraft cheese, thousand island dressing, fried onions and pickles, in another loving tribute to the Californian chain. These were also marvellous, and in contrast to the burger even looked scarily authentic, although after finishing off the former I didn't make much of impression on these. I thought about asking for a doggie bag, but I didn't want too many envious glances on the train home. In all the excitement it was easy to forget the reason we'd made the journey in the first place - to try the normal Goodman house burger. 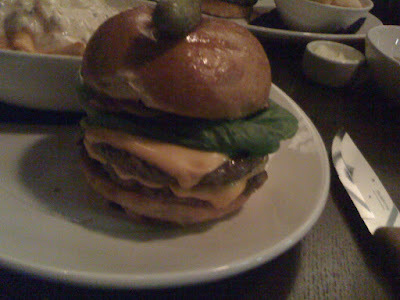 Utilizing a bigger bun, and with no cheese to mask the flavour of the top-quality beef, this was also a tremendously good burger. 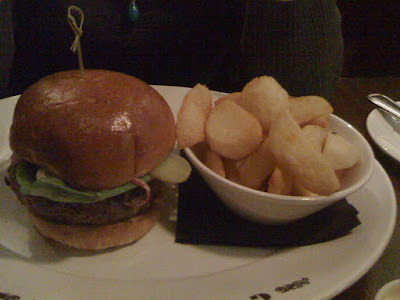 A straightforward construction of a single thick beef patty, lettuce, onion and pickle, it was presented with the dreaded fat chips, although these were cooked well enough. When I'm Supreme Ruler of the Universe I will enact a law that makes it illegal to produce any fried potato product between the size of roast potatoes and normal chippy chips, but until then there's nothing I can do, sorry. So yes, I really enjoyed my special In'N'Out burger, and can't thank Goodman enough for making this special and completely unnecessary effort just for me. 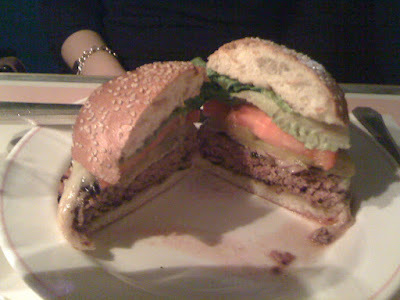 But more than anything, it was a relief to know that my relentless eulogising of the West Coast burger isn't just romantic holiday nostalgia - there really is something special about the multiple layers of beef, cheese and salad that mark it as something quite different from everything else in London. I'm also happy to point out that it won't appeal to everyone - it's just so greasy and full-on that I can easily see why some would prefer the more undemanding standard. More fool them. It's obviously no good me telling you to go out and try the Goodman In'N'Out tribute burger, because it's not on the menu, and I'm under no illusions about how ludicrously privileged I am to have tried it. But perhaps with enough pressure applied in the right places, the In'N'Out campaign may find unexpected success in the UK after all. Even a tribute to the In'N'Out burger is better than nothing at all. So come on, Goodman, are you up for it? 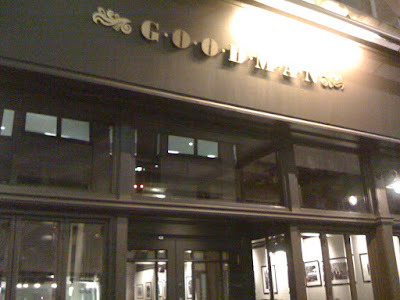 Both burgers were on the house, but the normal Goodman house burger usually costs £12. If there's a better afternoon to be had anywhere than hacking apart a variety of top quality meat, then I'd like to know about it. Allens of Mayfair, at 117 Mount Street - that's just opposite the Connaught and a few doors down from Nicky Clarke hairdressers, to give you an idea of the area - run butchery classes at their stunning Victorian shop every Wednesday at 1pm and attract a remarkable variety of punters (50/50 male/female most surprisingly) keen to learn more about that mysterious journey between the fresh animal carcass and the neatly trimmed cuts on your plate. I was lucky enough to be invited to this fascinating place with a handful of other food bloggers to see how badly I could disgrace myself when let loose with a chainmail glove and a dangerously sharp knife. The first animal to suffer at the hands of my knife skills was a plump, yellow corn-fed chicken. From this, we were shown how to separate the breast and the 'drumette' (the forebone closest to the breast) together into what I was surprised to learn was called a "supreme" - aren't these the ready meals you get from Tescos? And also, who knew all these years I'd been carelessly hacking through the part of the chicken Marco Pierre White cherished so much he would get through 40 or 50 chickens in an evening service just to separate this one part - the "oyster"? You live and learn. 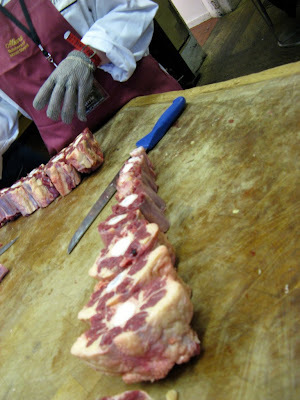 Next, a whole oxtail, which satisfyingly and smoothly separated into a dozen or so equal widths, ready for braising - providing, that is, you managed to find the millimetre or so between the joints that your knife could slide between. Easier said than done, believe me. 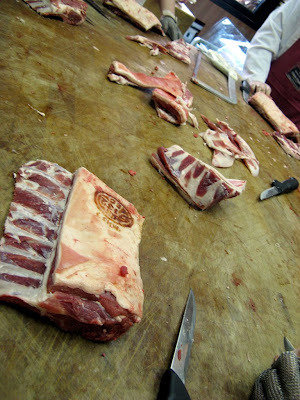 Then, a whole back of lamb was painstakingly sawn, sliced and trimmed into a pretty 8-rack, the kind you'd see in any high-end butchers but here, we were slowly and deliberately told, they remove the bitter, tougher top layer of skin so as to leave only the soft white fat on the rack. 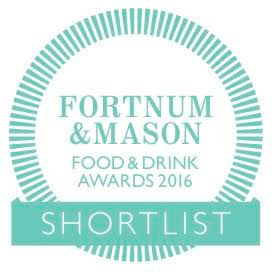 It's how the top hotels like it, and who are we to argue? 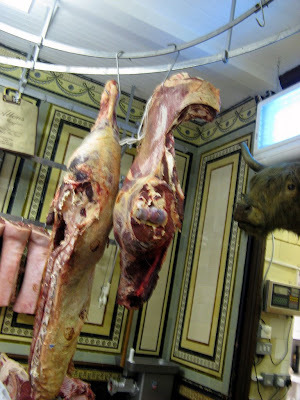 Having watched David, the head butcher, perform this task in a matter of a few seconds, it was therefore rather humiliating to still be sweating and swearing away at the 'sawing' stage well after most other people had bagged and tagged their pieces. Eventually David put me out of my misery and finished it off himself, in the manner of an impatient parent tying their child's shoelaces. The sight of an enormous 3-rib rack of sirloin was enough to put the smile back on my face, however. 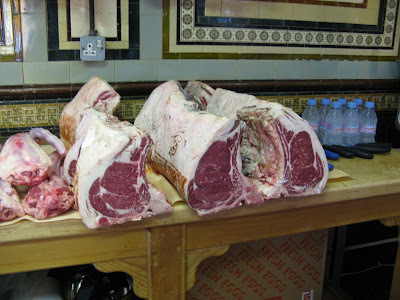 Gorgeously marbled, and clearly of a very high quality, we were nevertheless trusted to remove the roasting joint from the bone and have a go tying it up with butcher's string. The first bit, I had no problem with; it was only when attempting to tie up the joint neatly into a shape that resembled something you'd be happy to put in your oven that I eventually had to ask for yet more help. The shoelace-tying analogy was even more appropriate this time around. So despite my cack-handed attempts at various tasks, and my sore (or should that be saw?) arms, I left Allens grinning like an idiot. It was fascinating and hilarious fun. Also, I know £100 seems like a lot of money for an hour and a half's course but you get to take all the meat home with you(! 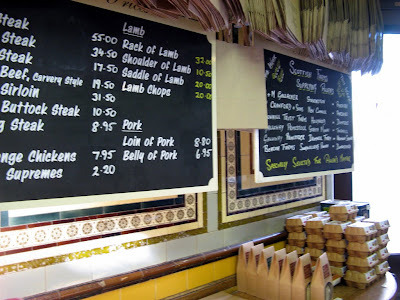 ), and an 8-rack of lamb, a whole jointed chicken, a whole oxtail and a massive roasting joint of beef (note: I believe usually there is something involving pork instead of the sirloins we were given) must be pretty close to being worth £100 even without the expert tuition and tour of the oldest butchers in London. 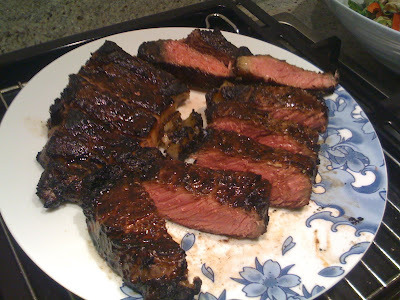 The next day, after slicing that joint up into nice thick steaks, I roasted them on my trusty Weber BBQ over a fierce heat. They were absolutely stunning. There was talk, towards the end of the afternoon, of the restaurants that Allens supplies, all prestigious establishments including Le Gavroche, Zuma and - my ears pricked up at this - Rules. In fact, when the season is right, Allens run game butchery classes, showing people how to pluck and gut my beloved grouse, as well as (for those with a strong stomach) the notoriously bloody and strongly scented hare. Sign me up. I was invited to Allens butchers. Courses cost £100 and can be booked here. Many thanks to Hollow Legs for the pictures - it's remarkably difficult to operate an iPhone with a chainmail glove on.